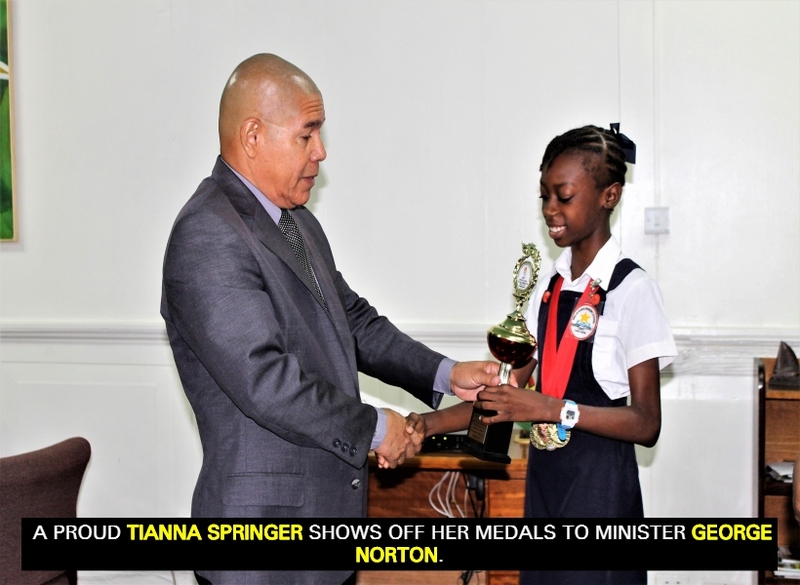 On Wednesday, February 6, 2019, Tianna Springer, a young athlete, visited the office of Minister George Norton, to say ‘thank you’. The 11-year-old, who delivered stunning performances at last year’s National School’s Athletic Championships, attributed her success to the kindness of the Minister responsible for Social Cohesion, Culture, Youth and Sport. A few weeks prior to the games, Minister Norton met the Stella Maris Primary School pupil on the sidelines of a sports function. It was there that the young athlete related her need for a pair of spikes running shoes. Within just a matter of days, Minister Norton delivered on his promise and presented the now gold medalist with a brand new pair of her very own running shoes. The Minister’s kind gesture seemed to have brought the young lady luck, as she was able to shine at the 100 meters, 200 meters, 400 meters and 1,000 meters races of the school nationals. More impressively, Tiana Springer of District 12 leaped to a new record in the ‘Long Jump Girls U-12’ category, clearing a distance of 4.18 meters. “Minister, we are very thankful for your assistance. Tianna has a lot of potential, and we are here to show you that your investment paid off, and it will continue to, as Tianna really does have her eyes set on making a name for herself in athletics,” the child’s mother said. Minister Norton expressed pleasure at Springer’s accomplishments, noting that he is expecting great things for her in the coming years. “I have recognised your potential, Tianna, and I want to encourage you to keep at sports. Even after you enter and leave high school, don’t give up. Continue to exhaust all avenues to compete and work on improving your personal best. If you do that, you might just end up amazing the world at some future Olympics,” Minister Norton shared.